I’m beginning to like chickens more than honey bees, purely for the comic relief. There’s nothing my chickens do that isn’t completely ridiculous. I can’t take anything they do seriously. 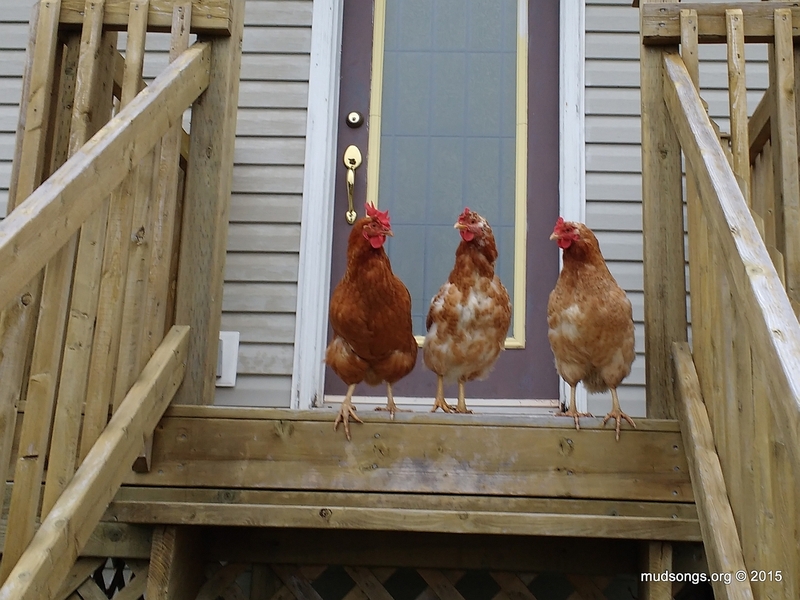 Three of them climbed up the high front steps of my house today because they felt compelled to guard the house, maybe? The way they walk, the way they run, the way they sound — it’s the definition of ludicrous. The enjoyment I get from just being around these farcical creatures exceeds the pleasure I get from beekeeping. To be honest, beekeeping has been more work than pleasure for the past three years. The simple satisfaction of being with the bees has been overshadowed by a long string of headaches I’ve had to endure, starting with moving my hives in May 2012 so my neighbours wouldn’t complain to the city about them. Now that I’ve finally found a country-like setting where I can keep my bees in peace, I hope I can relax around the bees again and perhaps recapture the wonder of beekeeping like I used to know. And if it doesn’t work out, at least I’ll have the chickens. This entry was posted in Mud Songs, Year 2015. Bookmark the permalink. So sorry that your rotten neighbors have ruined beekeeping for you. That stinks. :-( Your chickens are awfully sweet, though. If I had more land, I’d definitely get some. The neighbours didn’t completely ruin it, but moving my hives turned beekeeping into a chore, then I was hit with the nastiest colony of bees I’ve seen, then shrews killed most of my colonies, etc. Harvesting honey was fun, watching small colonies grow was fun — I had my moments. But it’s been a difficult three years. I’m ready to chill out and keep things simple and easy again. And the chickens help. They’re low maintenance compared to what I’ve had to do to keep bees for the past three years. I can’t help but feel relieved. The chickens have a ridiculously relaxing effect. Coincidentally we just bought some chicken pattern wallpaper to decorate one of our rooms with – we liked their comedy value too. Glad you enjoy hanging out with them.